While the Olympics come to a close in PyeongChang this weekend, another competition is underway at East Anchorage High School. That’s where over 100 students and their coaches have gathered for the state’s annual “Drama, Debate, and Forensics” Championship. DDF is an after-school activity grounded in public speaking. Sitka has two teams: one from the local high school and one from the all-Alaska boarding school. Despite the many rules, DDF offers kids an unusual amount of freedom. It’s crunch time before the state DDF competition. In a classroom at Sitka High School, DDF Coach Christian Litten is laying down masking tape on the carpet, in a square. Litten’s student, Joe Pate, rolls out the cricks in his neck preparing to practice his HI. That stands for humorous interpretation and the DDF judges will be looking for Pate to keep his performance inside of a 3 foot x 3 foot area. 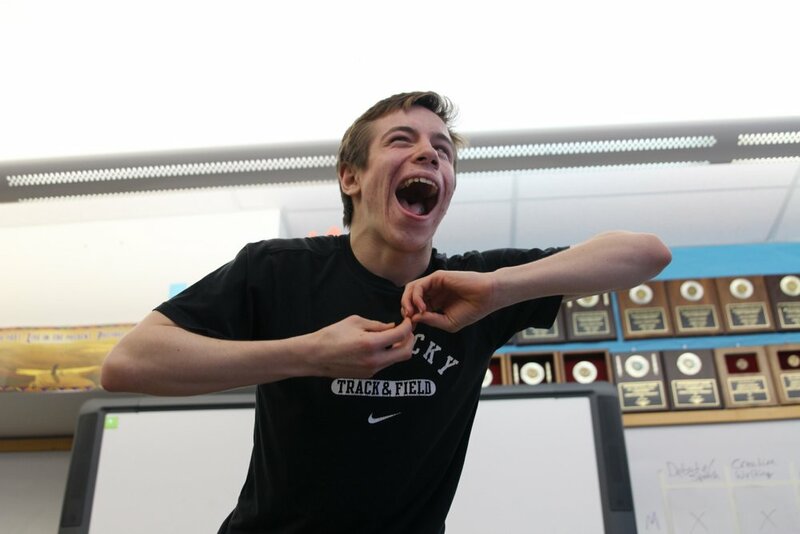 “It’s not my favorite exercise, but it keeps me in good shape for state,” Pate said. Practicing at home, Pate says, he’s broken a sweat, portraying four characters in 10 minutes. This is the moment his teacher character hands back the results from her pop quiz to her three terrified students, again, all played by Pate. Pate doesn’t stay quite within the box, but he does hit all the bells and whistles of what it’s like to be a high schooler: to be the teacher’s pet, the class clown, the loner. He’s been polishing this piece for months. Pate’s teammates are a diverse group of fifteen, some with a knack for research and debate, others with a flair for the dramatic arts. As a coach, Litten’s job is match a student’s unique strengths with one of 16 events. Unlike a sport or a particular school subject, there are so many ways to be good at DDF. Litten says that’s what drew him to DDF in the first place. 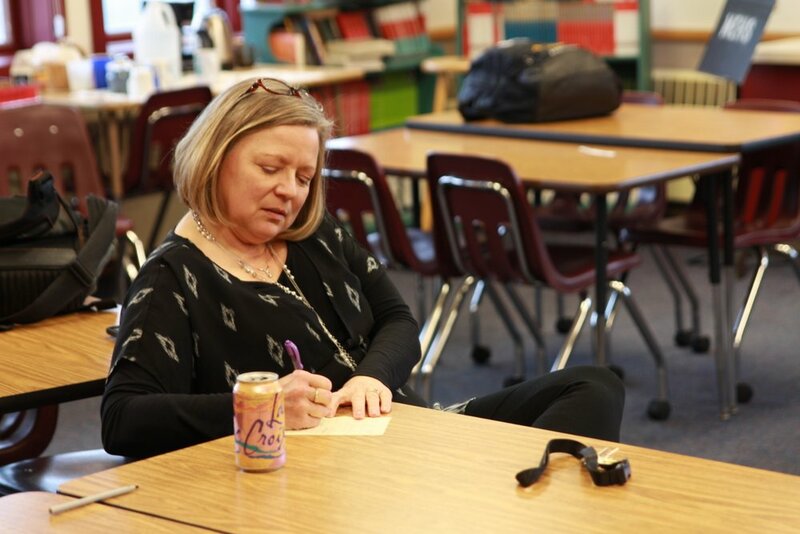 “When I was a high schooler, I was a kid that was not really into the academics of things and I was acting out, which is a funny term to use, and I ne eded some way to do that in a healthy environment,” Litten said. Litten says the ability to explore his emotions within the safety of a character got him through high school. When the coaching job opened up in 2016, he applied. The classroom is wallpapered with awards, a few from last year. Pate and Ella Lubin took first place in public forum debate, fending off fierce competition from Juneau and Anchorage. And Sitka High won Best in Drama, Best in Debate, and Best Overall among small schools. While it’s a big legacy to uphold, Litten says what’s most important is cultivating an environment where students can act out – in a healthy way. Some kids make that transition earlier than others. Just across the bridge is Alaska’s only state-run boarding school, Mt. Edgecumbe High School. Mt. Edgecumbe’s team this year is smaller than Sitka High’s, with six students instead of fifteen. Drake says her focus is less on winning awards and more on encouraging students to do their personal best. In 2017, Drake was chosen as DDF Coach of the Year. And she’s pretty humble about it. An hour after getting her plaque, she says, she was helping a student who had thrown up in her hotel room. Her students are big fans of Mrs. Drake. “If you have a mountain in front of you and you’re trying to get to the other side and you have no idea how to get there, I think she’d just be one of those people that would hold out her hand and help you every step of the way,” Freida Nicori said of her coach. Taylor Stumpf is a student who performed an original oratory in 2014 about transitioning from a woman to man. Before competition, Drake took him to a used clothing store to pick out men’s clothes and Taylor won first in state that year. This week, both Sitka High and Mt. 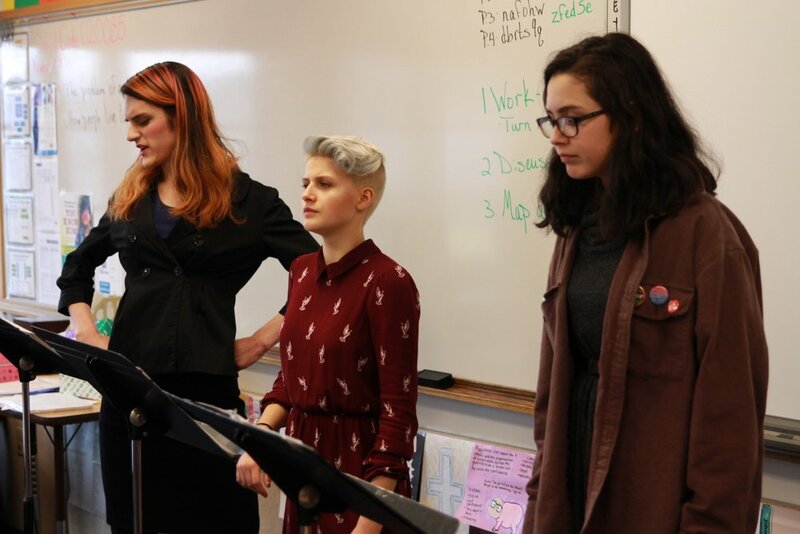 Edgecumbe boarded a plane bound for the state competition, taking their orations and dramatic interpretations, their debate notes and their nerves. But also their coaches, who will be there if they win, if they puke, and as they do their very best.